Babblings of a Mommy: Fall/Winter 2011 Trend Alert: Hiker Booties. 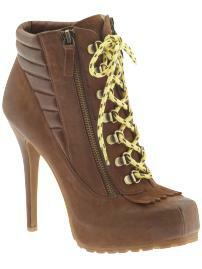 Fall/Winter 2011 Trend Alert: Hiker Booties. Where's the trail? Because these hiking boots are made for walking! They may not be suitable for a nature walks, but they sure are suited to fierce-up your wardrobe! This utility chic inspired shoe is the trend this season. A cross between a hiking boot and an ankle bootie, it features rugged details like d-rings and hiking laces, with soft lady-like touches. They're available in all different styles and come with various types of soles and heels to suit your personality. Who knew hiking boots could look so chic, right? What do you think? Are you liking the hiking boot trend? top photo: boutique 9 arael bootie. I think I could go for that second pair! I'm not in love with this trend. Seems so impractical--will my feet be too warm in these? Where am I going wearing them. I'm going to pass on this, but thanks so much for sharing on Monday Mingle over at Momtrends. The conversations make fashion fun! I can't decide how I feel about this trend either. I've seen a few pair of these booties that I like, only I can't imagine where I'd wear them! Visiting from Monday Mingle. So nice to find another mommy fashion blogger. I love these boots. I have been in search of loafers or booties with this hiking boot sole. You have some great examples here.